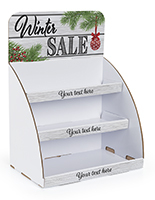 Is your retail or convenient store looking for an inexpensive solution for selling impulse items at checkout to grab some last-second sales? 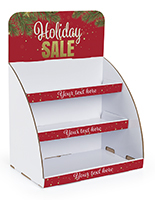 These cardboard countertop display boxes are an affordable merchandising option, enticing customers to add one last item to their cart before cashing out. 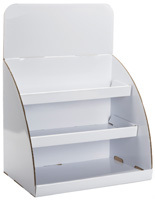 We offer single and multi-tiered shelving units as well as boards with removable peg hooks for hanging items. 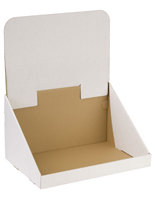 Our cardboard countertop display boxes ship flat, are lightweight, and are great for transporting between trade show booths, pop-up stores, and events. 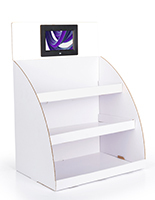 Many of our customers enjoy the single-use affordability these units offer in that it won't break the bank if they are left behind or thrown away after an event. 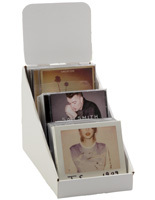 Use cardboard countertop display boxes to present merchandise such as CDs, books, lighters, batteries, candy, and other small-ticket impulse items at check-out. 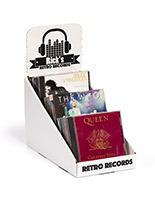 What different styles of affordable retail racks are offered here? 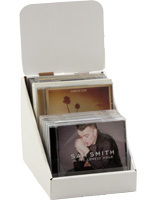 Single-tiered cardboard countertop display boxes excel at stocking many of the same product, or collections of similar products such as CD's books, lighters, and more. 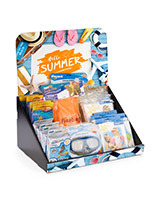 Focused assortment of similar items give customers a streamlined selection process while browsing in line. 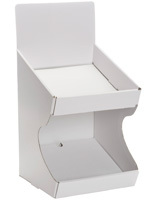 These simplified fixtures can offer different assortments of product colors, styles, and designs all in the same place. 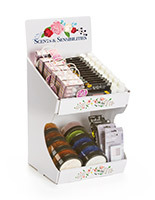 Multi-tiered countertop display boxes provide room for more options for thematic merchandising. 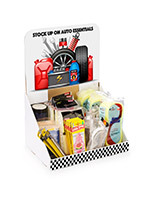 Showcase best-selling items from specific departments or promotions such as school supplies, car accessories, bathroom soaps, and incense. 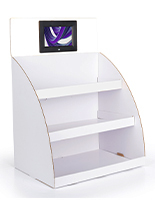 With two or more shelves, merchandisers can present larger selections of goods to maximize purchasing potential. 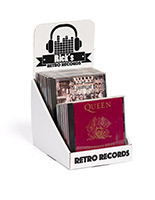 Tabletop display boxes with removable peg hooks allow retailers to place hangable such as key chains, blister packed items, and accessories. 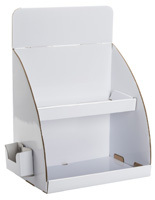 These fixtures place products at eye-level with customers and allow merchandisers to store large quantities of otherwise difficult to present items. 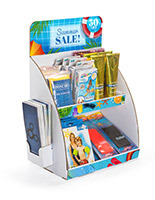 These affordable merchandising displays find a home in retail settings as well as at trade show exhibits. 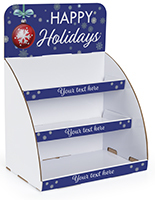 We offer a large selection of economy impulse tabletop display boxes including those with holiday themes and custom printing options. 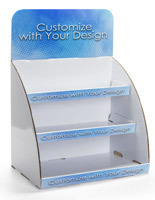 For affordable focused displays, check out our branded cardboard fixtures to create your own personalized store shelving. 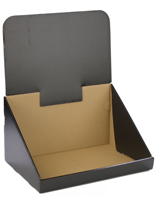 These lightweight commercial display boxes, including custom options, are ideal for one-off promotional campaigns and events. These fixtures are a low-cost option that offer a high return on investment while easily presenting merchandise for customers to browse at check-out.